The book charts the course and the history of how the regulation of financial services has evolved looking particularly at data protection. It addresses concepts like integration theory, the behaviour of nation-states when they attempt to forge geo-political unions and the implications and outcomes of state interaction in regulatory matters. Unlike many other General Data Protection Regulation (GDPR) publications in the market, it contains useful analyses of the GDPR but it does so in a very practical and informative way. It recognises the perspectives of various interests including academics and commercial organisations and presents the subject in a compelling, historical and easy to digest manner, starting with the challenges of integration that the EU has faced. 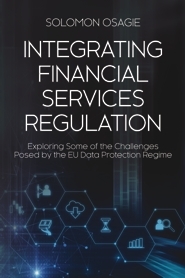 It then charts the course of general financial services regulation, focusing on the history of data protection legislation in the EU and drawing out the real challenges that are presented by the legislative framework. There is an in-depth analysis of the GDPR with examples of the derogations and areas where individual states are still able to derogate. The book ends with suggestions for the application and further review of the GDPR. In the presentation of the history of data protection regulation, the author shows the influence of the contrasting narratives of privacy rights versus the desire to enable commercial activity to thrive. There are examples of how the failure to harmonise the regulation of data processing has left individual EU states able to assert national influence so that commercial organisations have been left with a legal framework that impedes the development of a single market even with the increasing importance of big data and processing in financial services. The book then highlights key provisions of the GDPR that are designed to address some of the challenges by centralising interpretation, defining flow-downs and harmonising enforcement and regulatory provisions across the EU. Solomon Osagie is a leading financial services & CIPP/E certified lawyer in the UK where he has practiced for several years. Dr Osagie was educated at the University of Cambridge from where he received post graduate degrees in law and in international relations. He also holds a degree in law, an MBA as well as a doctorate in business and law from Anglia Ruskin University. Solomon has been invited to speak regularly and has published articles and papers on subjects like strategic management, regulatory matters and data protection. He was appointed to the Law Society's Company Law Committee and sits on several advisory boards including ACRITAS, the GC Financial Services Summit as well as the Legal Technology Summit. In 2017 he was invited to join the Lafferty BREXIT Council as well as the International Payments and Cards Council. He was also recently invited to join the Westminster Policy Forum contributing to the debate on the review of legal training in the UK. Dr Osagie has received many industry nominations including Lawyer of the Year at the Lawyer Awards, General Counsel of the Year as well as an entry in the FT rankings for 2016. He was also featured in the HOT lawyer List for 2016. He spent many years in private practice and then moved on to hold senior roles in Industry as General Counsel at Global Switch, at TSYS International and now at Cashplus in the city of London. Dr. Osagie provides a timely analysis of potential challenges facing the implementation of the GDPR in the EU Member states, through the prism of integration theories and historical analysis of the evolution of data protection and financial services regulations in the EU. A very good read for practicing lawyers, academics and GDPR regulators. This book a is an exciting read, presenting a thorough review of the history of how the regulation of data protection in particular and financial services in general has evolved. The analysis of the new GDPR and suggestions on further harmonisation and enforcement make sense. I would recommend it to businesses and academics.